Seoul has little to no leverage over Pyongyang and must rely on the US. Last week, US President Donald Trump and North Korean leader Kim Jong-un openly reiterated their interest in holding a third summit to resume nuclear negotiations that have been stalled since the their meeting that ended abruptly with no deal in Hanoi, Vietnam, in late February. The North Korean leader offered Trump another summit and set the year-end as a deadline during a speech Friday at a session of his country’s rubber-stamp parliament. “If the US adopts a correct posture and comes forward for the third DPRK-US summit with a certain methodology that can be shared with us, we can think of holding more talks,” Kim was quoted as saying by state-run Korean Central News Agency on Saturday, using the official acronym for North Korea. Cheong Seong-chang, vice president of research planning at the Sejong Institute, said Kim seems to be making a realistic decision that a meaningful agreement should be signed within this year in order to see his diplomacy bear fruit before Trump’s term ends in January 2021. Kim’s remarks came after Moon met Trump in Washington, where the two agreed that a top-down approach led by the leaders — one in which a summit preceeds working level talks, rather than the more usual order of working level talks first — is essential to facilitate further progress in nuclear talks. According to Moon’s national security adviser Chung Eui-yong, he will seek to hold another summit with Kim at an early date. 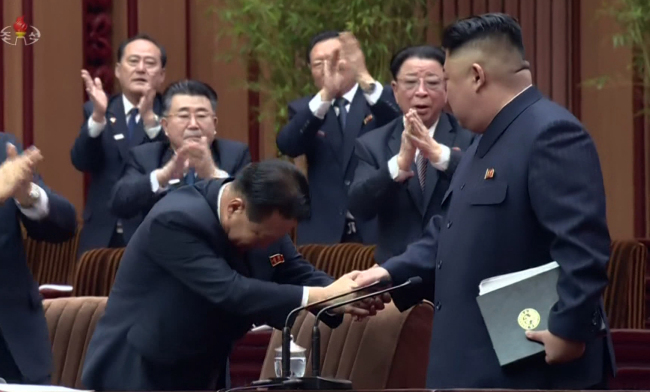 As a wide gap on denuclearization steps and sanctions relief that the US and North Korea expected from each other caused a breakdown of the Hanoi summit, whether the two countries have adjusted their standing to find common ground is gaining growing attention. During the meeting with Moon, Trump said that he is still sticking with the big-deal approach, which demands the North completely give up not just nuclear weapons, but also its biological and chemical weapons as well as missiles. “You can work out step-by-step pieces. But at this moment, we are talking about the big deal. The big deal is, you have to get rid of nuclear weapons,” Trump told reporters before the bilateral meeting. Regarding sanctions imposed against Pyongyang, he vowed to leave US-led sanctions intact. He stressed that the regime would not succumb to international sanctions and called for self-reliant economic development. “It (the US) is still shunning the withdrawal of its hostile policy, the fundamental way of establishing the new DPRK-US relations, and miscalculating that it can bring us to our knees if it puts maximum pressure on us,” he said. Analysts said Kim aims to send a message to Washington and Seoul by harnessing the meeting of the Supreme People’s Assembly. He gave a speech as the top leader of the country, the first time in 29 years — his grandfather Kim Il-sung did so in 1990. Setback for cross-border project push? While Moon was credited for bringing Trump and Kim together last year, expectations for his role were heightened this year, to act as a mediator between the two sides who have been open to meeting but reluctant to compromise. The Moon administration is believed to have asked the US to offer partial sanctions relief so that Seoul can use inter-Korean economic projects as a leverage to bring Pyongyang to the negotiating table. Trump, however, ruled out the possibility of partial lifting of sanctions that could enable operations at the joint Kaesong industrial park and at resort facilities in Kumgangsan, at least for the time being. “At the right time, I would have great support. This isn’t the right time. … When the right deal is made, and when nuclear weapons are gone, I just think that North Korea has great potential to develop,” he said. Persuading North Korea without Trump’s support on sanctions relief will be a daunting task for Moon, experts said. Seoul-based Institute for National Security Strategy said in its report that the responsibility and burden will weigh on Seoul as it has to engage with the North with little leverage, as Washington is passive on allowing upfront incentives and Pyongyang is taking an unyielding position. “North Korea will not feel the necessity of dialogue with the South as it hasn’t managed to change the stance of the US,” said Choi Kang, vice president of the Asan Institute for Policy Studies. North Korea has been persistently urging the South to play the role of a “concerned party,” rather than acting as a third party mediator. During his speech last week, Kim called on the South Korean authorities to come back to their stance of the time of his meetings with Moon in April and May at Panmunjom and in September in Pyongyang. “The South Korean authorities should not act as an official ‘mediator’ and ‘booster’ with a vacillating stand depending on the trends and engage in an array of visits, but be a party advocating the interests of the nation with its own spirit and voice,” Kim said. His remarks were interpreted in different ways by South Korean political parties. “President Moon’s position is gaining more attention as he receives requests from the US and North Korea that run counter to each other,” said the Party for Democracy and Peace’s spokesperson Kim Jung-hyun. The ruling Democratic Party spokesman Hong Ihk-pyo said Pyongyang’s criticism is a message to Seoul to persuade the US more actively. On the other hand, Liberty Korea Party spokeswoman Jun Hee-Kyung said that North Korea publicly told President Moon to take its side, saying Kim’s remark insulted Moon and the people. As a part of the efforts to prepare for an inter-Korean summit, the South Korean government is expected to send a special envoy to Pyongyang soon. Presidential security adviser Chung Eui-yong and National Intelligence Service chief Suh Hoon are regarded as potential candidates for the job.